What Type Of Blanket Is Best For Soundproofing? Blankets can make a huge difference to the acoustics of a room if you use them correctly. They can be an effective method of getting a cheap and temporary solution to an immediate noise problem. 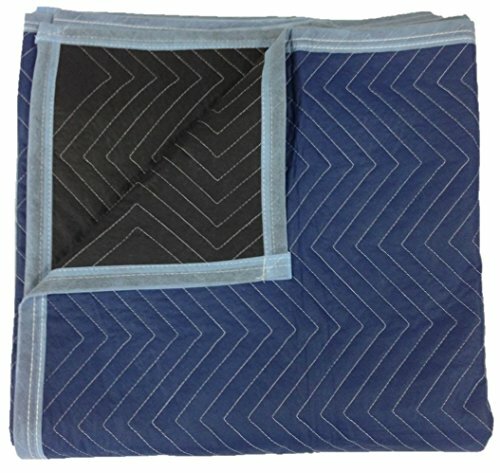 If you live in student halls or rented accommodation where you can’t really take on a big soundproofing project, or if you find yourself unable to sleep one night because of a wild party which won’t quieten down, despite your best efforts to tell them kindly to shut up, then blankets are a viable sound reduction solution which you can quickly get setup and ready to go without causing any structural damage to your room. Sure blankets aren’t going to make your room impenetrable to all sound. However they can help muffle and deaden external sound to a reasonable level. If you are looking for other cheap soundproofing methods read our article on How To Soundproof A Room Cheap. While your room isn’t going to be transformed from sounding like a tent pitched in a nightclub to an empty library blankets will have a much bigger impact than attempting to soundproof your room with egg cartons! For example if you are struggling to sleep because you can hear someone next door talking then using blankets can have enough of an impact to help you get a decent nights sleep…especially if you have soundproof blankets available, these tips will still work even with standard blankets. The thicker the blanket the better. A thicker blanket will better muffle vibrations and airborne sound. A thicker blanket will also have more material to stuff into any gaps such as the gap under a door. The main thing with any blanket you use is you want it to be dense. Density is more important than thickness as some thick blankets can be very airy, these may be very comfortable for sleeping under but they won’t do a great deal when it comes to soundproofing as air borne sound will easily pass through the air in them and the lack of density means that is not much material in them to muffle sound vibrations. A dense blanket will dampen vibrations much better than a thick airy blanket. The best blankets we have found to use for soundproofing a room are moving blankets. These are blankets designed for protecting furniture from damage when it is being transported. They are suitable for soundproofing because they are very dense so do a good job of dampening sound vibrations. However if you are looking for an immediate fix to a noise problem these techniques will all help reduce sound with any blanket you choose to use. Your doors are the first place you should start in any soundproofing project and that is no different when you are soundproofing a room with blankets. Doors can leak a lot of airborne noise through the gaps around the frame and under the door. They also transmit vibrations and can even seem to amplify some sounds, especially if your door is hollow. Adding a blanket to your door will help muffle air borne sound, particularly if you buy an over sized blanket and use it to block any gaps around your door. it will also help muffle any vibrations reverberating through the body of your door. There are a number of ways you can hang a blanket on a door, the most permanent solution would be to fit a wire across the top of your door, screwed in at both ends. your blanket can then be either hung or tied over it. However most people looking to soundproof a room with blankets will probably have a rather more immediate and urgent need so you may not have time to install wires. We therefore suggest that you either just pin the blanket into the door frame above the door (this will allow it to hang over the door covering all gaps). Preferably use small nail pins rather than drawing pins as these are much stronger and are unlikely to fail, however if drawing pins are your only choice then use plenty…especially if the blanket if fairly heavy. Another option for people who have no pins to hand is to simply wedge it into the door frame, do this by draping the blanket over the door while the door is open and then closing the door on it tightly. This will seal the door shut. Be aware that if you are using a very thick blanket then it may not be possible to close the door so only use a thin blanket for this. After your doors your windows are likely to be the place where sound will most easily leak through, especially if your windows are only single pane. Covering your windows with blankets will help to absorb vibrations coming in through the windows. If your window is not a perfect fit and you can feel a draught coming through then it is likely than air-borne noise is also coming through your window, covering your windows with moving blankets will help to muffle airborne sounds. Obviously covering your windows isn’t ideal as this will block natural light from coming into your room so we advise you only use this in an emergency scenario, for example if your neighbour over the road is having a wild party and you’ve got to be in work in six hours! Covering a window with a blanket isn’t easy but ideally you should try to fit it as close to the window as you can, simply hanging a blanket over your curtain rail is likely to have a very minimal impact. You want it as tight to the window as possible to help muffle vibrations as soon as they hit the window and block any air borne noise. Wedge the blanket into the window opening and then close the window on the blanekt allowing it to hang down over the window. Use pins to secure the blanket to the window frame. Modern apartments, particularly places like student accommodation complexes often feature abysmally thin walls through which you can hear every yawn, hiccup and whisper that your neighbour makes. If you have a neighbour in the next room who has a regular and irritating habit of having late night conversations on skype, watching TV or playing computer games then, if they don’t respond well to you asking them politely to quieten down then your next best option would be to hang some blankets on your walls. This will help slightly increase the density of your walls which could make a sufficient difference to allow you to get a decent nights sleep. Using blankets, or even soundproof curtains which have grommets in will make it far easier to attach them to your walls. The easiest and most efficient way to hang blankets on your walls is to nail them to your wall, ensuring that they are hung as high as possible so that all of the wall is covered. You can use picture nail pins so that the damage to the wall is minimal and can easily be hidden with the tiniest bit of polyfiller when you are done. If you are having problems with sound from the room above yours then you could attach blankets to your ceiling. Admittedly this is a highly impractical solution which is very difficult to execute well and will have very minimal impact when it comes to blocking sound. A far more effective way to deal with sound coming from above is to buy your upstairs neighbour a big thick rug to put in their room. This will absorb a lot of the impact sound and will make your life much easier. However if buying your upstairs neighbour a rug simply isn’t an option then you could try attaching a moving blanket to your ceiling. Just don’t expect great results though! To do this use nails to secure the blanket, we don’t suggest that you use picture nail pins as these are very thin so the blanket is likely to slide off them. You will require a nail with a fat head so that the blanket will remain secure. We hope some of the tips you read hear were useful in helping you to improve your prospects of a good nights sleep.